A police officer sees a man driving without a seatbelt and makes a traffic stop. Instead of complying with the repeated, polite requests from the officer, the stopped driver decides he doesn't have to comply. Because racism, or whatever… Then the driver proceeds to body slam the cop into the pavement and then strikes him in the back of the head. Whereupon a rookie female officer shoots the offender in the back with her service pistol rather than using her TASER. Instead of a $100ish seat belt ticket and a minor inconvenience, Akira Lewis, 35, got a trip to the hospital and a fresh gunshot wound in his back. That may have been because he had outstanding warrants for his arrest that would have come to light upon presenting his ID, so he wasn't going anywhere but jail. And Mr. Lewis knew it. In the end though, he went to the hospital, lucky to escape with his life. The incident took place last May. Here's the just-released dashcam video of the shooting (the altercation starts at about the 6:25 mark). Watching the video, it surely seems as though a strong case for justifiable use of deadly force exists. The larger, non-compliant suspect not only resisted, but did so with great violence. He body-slammed the physically smaller cop into the pavement and then struck the officer in the back of the head. The assault looked as though it would continue had it not been for the second officer shooting the suspect. 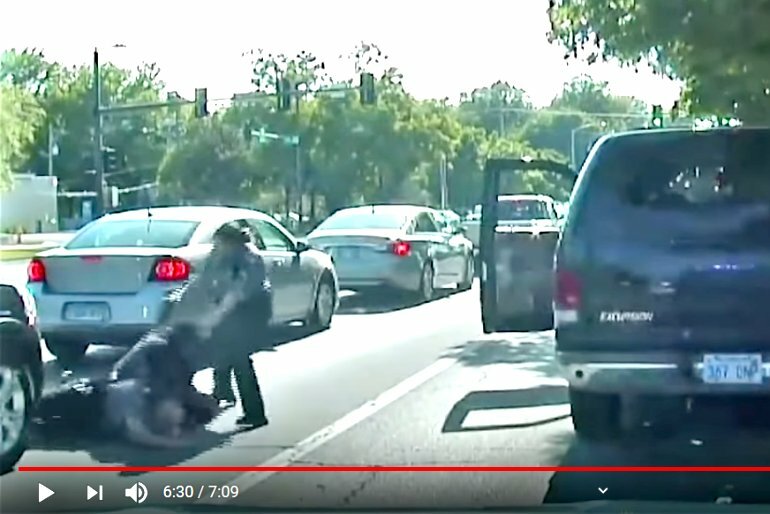 Frankly, absent a second cop, I would have considered shooting the driver as well if I had witnessed that savage attack on a law-enforcement officer on the side of the road. Lewis begins to protest about being stopped, then proceeds to drive forward about a car length, causing McCann to jump backward away from the SUV. Lewis then stops, McCann walks back to the window and their conversation continues. Lewis refuses to provide his name or driver’s license, curses at McCann and repeatedly demands that McCann summon a supervisor to the scene. McCann explains to Lewis that if he fails to comply, he will be placed under arrest and taken to jail. He tells him he won’t call a supervisor, as the stop is blocking traffic at a busy time of day, and tells him he can file a complaint later. Remarkably, the rookie officer, Brindley Blood, is now facing a charge of aggravated battery. Of course, prosecutors can indict a ham sandwich if they want. It doesn't mean a court will convict. In this case it's another ambitious District Attorney making the charging decisions. More from the Journal-World . . . Blood — a rookie officer who’d only been on the streets on her own about two months before the shooting — resigned from the police department in late January. Previously she had been on paid administrative leave. Lewis is charged with battery against a law enforcement officer, interference with law enforcement and driving without proof of insurance, all misdemeanors, and failure to wear a seat belt, a traffic infraction. 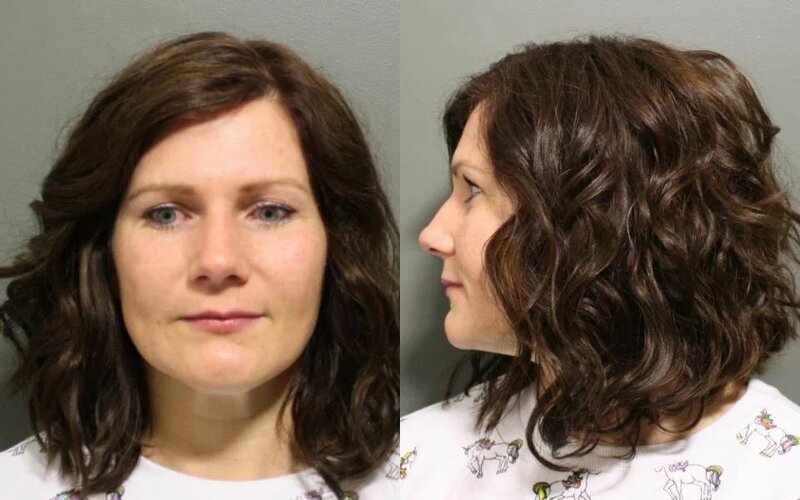 At the time of the traffic stop and shooting, Lewis had outstanding warrants for failures to appear in court in three older traffic cases, one in Douglas County District Court, one in Lawrence Municipal Court and one in Johnson County District Court, according to court records obtained by the Journal-World. The Johnson County Sheriff’s Office investigation into the Lawrence shooting confirmed Lewis’ driver’s license had been suspended since September 2017 with no eligibility date for reinstatement, and that he’d been ticketed six times since 2010 for driving without a valid license. Time will tell how the case plays out, but Officer Blood's use of force will certainly remain a matter of debate. Yes, it appears she meant to use her TASER, but in the heat of seeing her fellow officer getting beat down by a very large, very strong man, she reached for her gun instead. Looking at this video, she was still justified in using deadly force, even if it was a mistake. Of course, people's personal biases will color their interpretation of the events that day. Fortunately, we have it all on video for a (somewhat) more dispassionate evaluation. From my seat in the stands, it looks like a righteous shoot. Blood's actions were not perfect, but legal precedent does not demand they be perfect, merely reasonable. This entry was posted on April 1, 2019 at 1:27 pm and is filed under GunNews. You can follow any responses to this entry through the RSS 2.0 feed. So…. GSL gets involved in controversial cases, such as the James love case, but not one where you could actually have the back of a police officer, who at the very least, could probably use some moral support. ??? You constantly brag about how huge GSL is, and how your presence is in numerous states, so……. what's the deal? Are you all talk? Mr. Love wasn't a GSL member, so that can't be the issue. What's up, John Boch? If I was color blind, I would have no idea as to why she was charged! Fortunately I’m not!